Auteur Orionist, previous versions by Makaristos, Mysid, etc. 14 août 2010 à 06:27 1 200 × 600 (691 octet) Orionist Uploaded new version of the flag as per the new 2006 laws. 16 avril 2008 à 02:42 1 200 × 600 (3 Kio) R-41~commonswiki Corrected colours, previous colours appeared greyed down, these colours are the same as those of Jordan's flag, which the flag is based on. 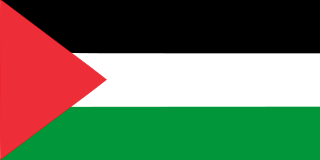 Ce document provient de « https://fr.wikipedia.org/wiki/Fichier:Flag_of_Palestine.svg ».